For most average-size customers over 5'4 in height and under 5'11, our medium lift chairs are the best option. 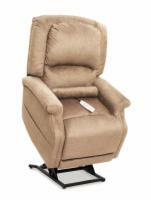 Choose from lift recliners manufactured by Golden Technologies or Pride Mobility and customize your selection with a wide array of fabric choices! For additional details about any liftchair you see on this page, we invite you to call us at 1 (800) 285-2584. 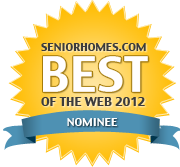 If you would prefer to contact our customer care experts via email, you can do so by clicking here. We will follow up with you via your choice of telephone or email. Want to see a side-by-side comparison of two products? Check the "compare this product" boxes, then click the "compare" button to see how two products measure up against each other. An incredible deal - a full featured lift chair, free shipping, and a 1-year in-home parts & labor warranty included. FREE delivery and FREE in-home warranty service! Minimum Recommended Height 5' 4"
Maximum Recommended Height 5' 8"
The LC-105 Lift Chair is designed to fit a medium to large size person. Minimum Recommended Height 5' 2"
Golden Technologies' Value Series Lift Chairs are making their way to the top as an industry leader in lift chairs. The Capri is the finest in quality and comfort and at half the price! FREE in home DELIVERY and FREE in-home warranty service! Maximum Recommended Height 5' 10"
Golden Technologies' Value Series Lift Chairs are making their way to the top as an industry leader in lift chairs. 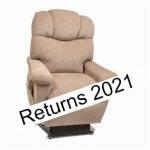 The Golden Monarch has has more features than other more expensive recliners. 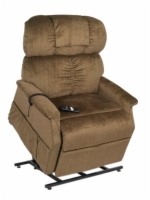 Experience the comfort of a lift chair with built-in HEAT and MASSAGE units! Enjoy the luxury of lower back heat and vibrating massage for an incredible value! 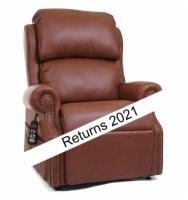 The LC-250 Lift Chair is a Chaise Lounger designed to fit a medium to large size person. 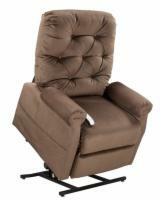 The PR-401M Cambridge 3-position lift chair has a super plush biscuit back cushion design. Minimum Recommended Height 5' 1"
Maximum Recommended Height 5' 6"
Golden Technologies' Comforter Series Lift Chairs are cutting edge in the lift chair industry. 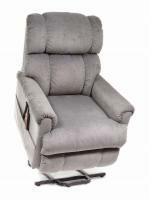 The PR-501M Comforter Series Lift Chair sets a new standard in craftsmanship and affordability. The GL-358M 3-position Lift Chair by Pride is a lift chair designed to fit individuals of average size. 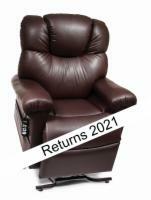 A medium size lift and recline chair that features Zero Gravity technology. Golden Technologies' Comforter Wide Series Lift Chairs are extremely comfortable and extra wide for additional support. Enjoy better relaxation and mobility in your own home with the versatile and affordable LC580iM infinite position lift chair. 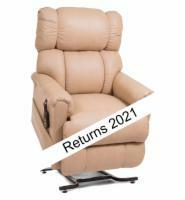 The PR-756 Medium Relaxer MaxiComfort lift chair is Golden's most luxurious lift chair. Minimum Recommended Height 5' 8"
Maximum Recommended Height 6' 2"
Zero Gravity positioning and overstuffed padding with a bucket seat design for optimal user comfort! Minimum Recommended Height 5' 7"
Maximum Recommended Height 6' 4"
The best in comfort and mobility are showcased in the new Golden Power Cloud PR512. This super plush and highly adjustable chair will provide you with the ideal level of customized cushioning and support.